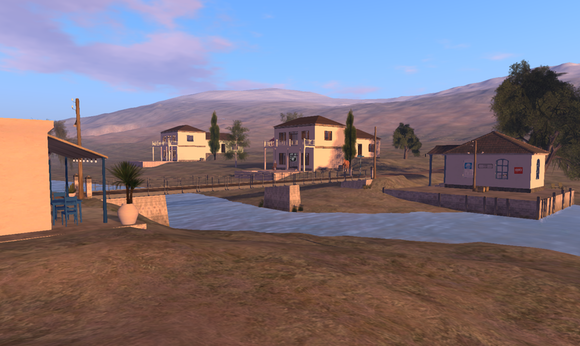 xmir is a small grid that welcomes hypergrid visitors both to explore and shop for unique mesh and wearable items you will not find other places in the open metaverse. The grid currently has 35 public accessible regions plus one sandbox and the welcome region for new registered users. In the south the grid has the characteristics of a Nordic costal landscape that dramatically changes as you move north to The Murat River valley set in a mountainous Middle Eastern landscape. You will not find glamorous places, dance clubs and big shopping malls, but rather cozy ordinary places, small stores with interesting items to get, street cafes and benches to sit down and soak in the views of a landscape that changes with the seasons and is constantly evolving. There is even a chapel and a mosque to visit. The grid is rather unique in that it runs on Mac OS X with mono and a PostgreSQL asset database. You will find more information on this in the Tech Talk pages.